The Great Egret's overall plumage is white, and, for most of the year, when not breeding, the bill and facial skin are yellow. The feet are dark olive-grey or sooty black, as are the legs. During the breeding season, the bill turns mostly black and the facial skin becomes green. Also at this time, long hair-like feathers (nuptial plumes) hang across the lower back, and the legs become pinkish-yellow at the top. Young Great Egrets are similar to the adults, but have a blackish tip to the bill. The Great Egret can be confused with other white egrets found in Australia. It can be distinguished by the length of its neck, which is greater than the length of its body (and with a noticeable kink two-thirds of the way up), a dark line extending from the base of the bill to behind the eye and the overall larger size. Great Egrets occur throughout most of the world. They are common throughout Australia, with the exception of the most arid areas. Great Egrets prefer shallow water, particularly when flowing, but may be seen on any watered area, including damp grasslands. Great Egrets can be seen alone or in small flocks, often with other egret species, and roost at night in groups. The Great Egret usually feeds alone. It feeds on molluscs, amphibians, aquatic insects, small reptiles, crustaceans and occasionally other small animals, but fish make up the bulk of its diet. 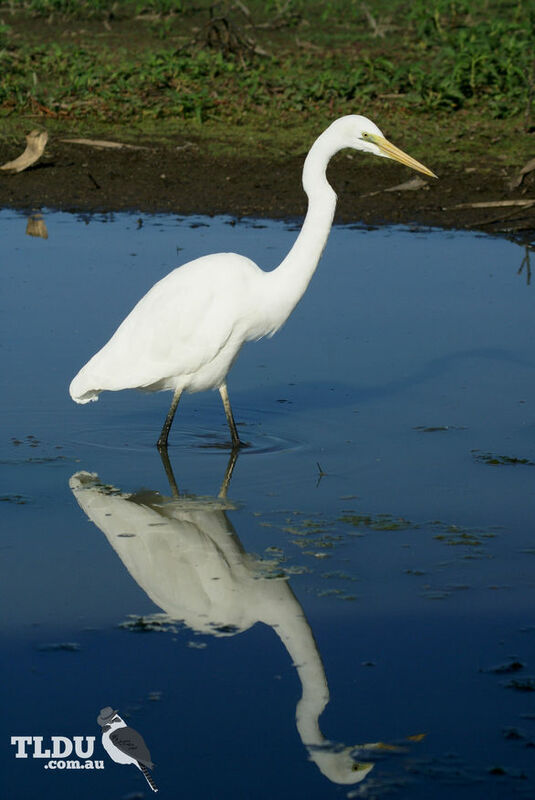 The Great Egret usually hunts in water, wading through the shallows, or standing motionless before stabbing at prey. Birds have also been seen taking prey while in flight. 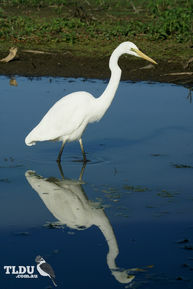 The Great Egret breeds in colonies, and often in association with cormorants, ibises and other egrets. Both sexes construct the nest, which is a large platform of sticks, placed in a tree over the water. The previous years' nest may often be re-used. Both sexes also incubate the eggs and care for the young (usually two or three).